Our writers talk political affiliations among friends, teachers who make their politics known in the classroom, and what it's like to have strong political views in high school. Politics can be a tricky topic to talk about in general, but does that mean it should be avoided? What about when it comes to the classroom? Do young people have a right to have their political opinions counted? These were the kinds of questions we posed to our student writer advisory group (SWAG) this month. 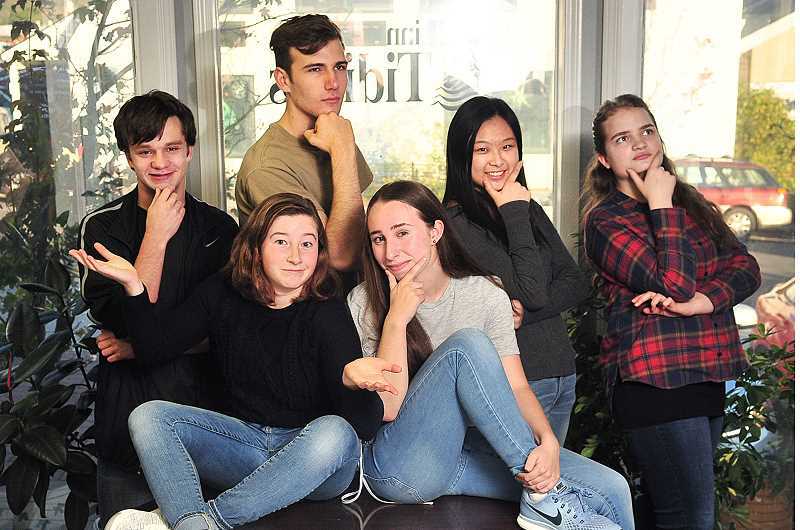 A bill recently was introduced in the state Legislature to lower the voting age in Oregon to 16, so we decided to ask our young writers their opinions on politics in schools. Our writers talk political affiliations among friends, teachers who make their politics known in the classroom, and what it's like to have strong political views in high school. The voting age may be up in the air, but one thing is certain — teens are aware and involved in politics today. It's hard to fault anyone for forgetting that politics wasn't always like this. This especially rings true for high schoolers. Around the time we actually started paying attention to politics on a national scale, every rule and norm seemed to go out the window. The 2016 election evoked animosity by radicalizing the parties and driving them further apart. Party affiliation was no longer just a minor detail about you, but your defining characteristic. There are some outspoken students who enjoy proclaiming their political beliefs in the classroom or on social media, but I would argue that the vast majority of us limit our political discussions to those who share the same beliefs as us. All of my friends and I share nearly identical political opinions, so we have little trepidation when it comes to having conversations about them. It's far more difficult for a liberal-leaning student to set out to have a civil conversation with a die-hard Trump supporter (or vice versa) because all of the issues at stake feel so personal. Classes generally avoid politics altogether, which is probably the best choice. However, it can be jarring to know that, while we're studying chemistry, the next Supreme Court justice is being accused of sexual assault. The students are buzzing about how the Democrats took back the House, but class proceeds as usual. Again, this is not a bad thing — we go to class to learn about a specific subject, not to get into debates about the current political climate. What schools can do is encourage students to listen to one another and find common ground. This is easier said than done, but the ability to listen rather than fight is vital. Schools also are responsible for educating their students and providing them a nonpartisan education. We need to know how to make our own decisions instead of going along with what is fed to us by our peers or families. My generation is arguably more invested in politics than any of its predecessors; we will be a force in future elections. A lot of us are dissatisfied with the current state of the government. We can't succeed without compromise, so why not begin with listening to our peers now? Last year, I was jotting notes in history class when I looked up to find a hand directly in front of my face. The hand held a pixelated color copy of the Second Amendment, which it then plastered to my teacher's podium. To clarify, the podium was no typical podium; it was a "no man's land" of political posters and stickers, manifestos and propaganda. Some papers along its sides were hung jokingly, while others were hung with seriously political motivation. No one paid much attention, or so I thought, until I noticed the hand. Having just published an article on gun safety legislation in The Oregonian, I figured that few (if any) of my high school peers would care to read about my thoughts on firearm relinquishment or safe storage or high-capacity magazines. The teacher's podium, too, had become only a relic of a distant time when students openly expressed their political leanings. I noticed that in class, most students had generally drawn inward. In class, few engaged in political conversation, and only from rare occasions like this poster-hanging did I catch a glimpse of political beliefs asserted in action. But the Second Amendment poster got me thinking: Perhaps people did care more than I had previously thought, and perhaps it was me who had drawn inward for only having talked about the Second Amendment with my like-minded peers. So I respectfully revisited political conversation with other peers and, while talking to some, ultimately found what I had sought: challenging opinions. Throughout our conversations, I learned that many students were unaware of the legislation that I and my gun violence prevention group (Students for Change) had been advocating for. But what surprised me was that nearly all students were willing, in one-on-one conversation, to lend their insight. Simply, they were willing to hear my voice and then share theirs; for once, political discussions felt civil and less battlelike. From these critical interactions, I reidentified the importance of politics in school, and realized that the classroom doesn't have to become a divided political battleground. It is this optimistic attitude from the power of conversation with my thoughtful peers that continues to influence my advocacy today. A political opinion, by definition, is a set of beliefs and morals held by the population, and since school is supposed to be an environment that cultivates the unique growth of individual mind-sets, the idea that politics shouldn't be discussed in a school environment is simply illogical. Politics is the driving force behind personality because the fundamental issues that divide political parties are the same differing traits that make up personality. The important argument that comes with teaching politics is that its teaching cannot be biased or teenagers would be better off gathering their only political knowledge from Fox News or NBC and trying to formulate a unique opinion. I've been taught by educators with varying degrees of partisanship, but I've gotten lucky because with all, my parties lined up with all my teachers' views. I do recognize though that students with opposing beliefs feel threatened by this person of power not being able to separate their opinions on politics with their feelings toward the students, and it shows. The only nonpartisan education I've received was in a middle school social studies class, and it was the best class I have taken to date because of the freedom of expression in the classroom, the freedom of growth. All year, kids would try to wrestle personal beliefs out of our teacher and every single time, he would refuse because he recognized the influence he had as a person in power on the rest of the kids. He wanted to create a classroom void of unspoken judgment, where no kid would feel threatened to gain the confidence to cultivate and voice their own opinion. This environment is so necessary because it gets rid of that "conformist agenda" that everyone criticizes schools for having. It creates a place where students can grow without the fear of bias from their educators and nurture their confidence to be themselves. We can't avoid politics in schools, but we can avoid the negative stigma that comes with it by ridding it of bias. When reporting on events, I admire journalists when they focus on facts rather than their own opinions. I sometimes make exceptions when journalists write personal essays, similar to this one, but that is about it. I think the same works for school. I feel that when teachers share their political beliefs, it makes students with opposing views feel uncomfortable. For instance, in history class, students often write papers involving their political beliefs. If a history teacher was to share their own political beliefs, students might think they would be graded unfairly for thinking differently; or, students might automatically write papers agreeing with the teacher's beliefs in order to get great grades, rather than coming up with their own ideas. Think of it as the opposite of what I heard someone say in middle school: Do not write a book report on a novel your teacher has read. It is a phrase I have lived by since then and has helped me become the most mediocre student who has ever lived. Back to the article, I think school, like the media, would be better if it paid more attention to facts than other people's opinions; through this, students could get a proper education and know exactly what is happening in the world.